As the first phase of the seven-phase Lok Sabha elections began today, people in 18 states and 2 union territories had been visiting the polls since 7:00 am. As the day prolonged, suddenly heads started turning when the world's tiniest woman and Guinness World Record holder Jyoti Amge turned up to vote at a polling station in Nagpur. According to IANS, the 25 year old, who is just 2 feet and 1 inch, turned up to her polling station in a red-and-white checks sleeveless dress and exercised her franchise. After casting her vote, Amge said "I request all people to vote. Please vote first and then go to complete all your other works." This little star is a celeb cook and entrepreneur. She has appeared in Bigg Boss 6, acted in American and Italian television series and has her own statue in the Celebrity Wax Museum, Lonavala, Pune. This page contains news relating to various facts and events. The views are generally about current affiars and general topics in diversified areas such as political, international, national, and regional issues, sports, health, travel, lifestyle, technology and business. People having similar interets on the above topics will find this page useful. 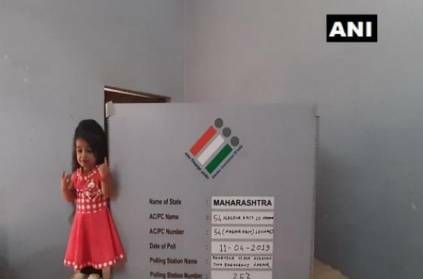 World's tiniest woman casts her vote in Nagpur | India News.